One of the things I’ve always got an eye out for are books published on small presses in Africa. It’s shocking how little about Africa makes into mainstream U.S. consciousness (or most alternative U.S. consciousness, for that matter), especially since it is the second most populous continent, and second largest geographically. After the anti-colonial struggles in the 1950s and 60s (and 70s/80s in Portuguese-dominated Africa and Southern Africa) there was a veritable explosion of African writing and publishing, the most well known example being the Heinemann African Writers Series (AWS), edited by Chinua Achebe. Although Heinemann is a British press, much of the work behind AWS was directed and executed by African editors in local offices in Nigeria and Kenya. There were other significant African presses as well, riding high on the optimism of a decolonized continent, the belief in the nascent socialism of many regimes, and a huge drive for literacy in many countries. Some of the biggest of these presses include East African Publishing House (based in Nairobi, my posts on them forthcoming! ), Zimbabwe Publishing House (see my post on ZPH HERE), and Mbari (based in Ibadan, Nigeria, posts on them forthcoming as well). I’ve also run posts on smaller but important African presses such as Ghana Publishing House and Éditions CLE. Unfortunately by the 1980s, a combination of austerity, neo-colonial structural adjustment programs, the rise of paper prices, intense poverty, and a mess of coups and calcification of increasingly totalitarian regimes led to a shrinking reading population and the collapse of many—if not most—of the publishers on the continent. For much of the late 80s and 90s the only surviving presses were those that published for the academic or religious markets, and could survive off selling books as texts for primary, secondary, and university classes, as well as mega-churches. The mass market for books all but dried up. In the 2000s that started to change, with a growing field of upstart operations printing cheap photocopied and print-on-demand editions of popular novels. Now it seems like publishing is beginning to thrive again on the continent, with new publishers popping up all over Africa. Throughout this whole cycle, there have been hundreds of small presses operating throughout Africa over the past half century, but few if any of their books make it over to the U.S. I’ve found some floating around at used book shops, and some at yard sales, but many of the editions I’ve picked up traveling, either in the UK or in South Africa. Beyond my sociological, political, and historical interest, many of these titles also have interesting covers, so I’m going to share some this week and next. 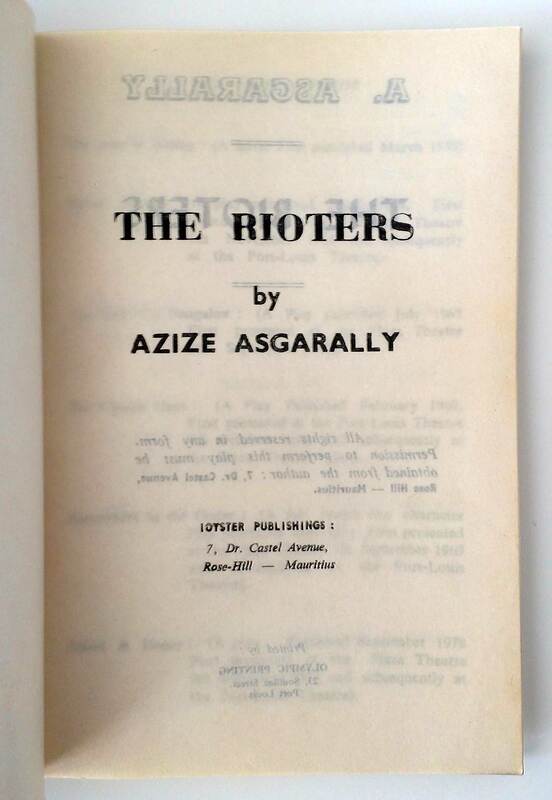 First off is a play, The Rioters by Alize Asgarally. It’s the only book I’ve ever seen published in Mauritius, a small island off the East coast of Madagascar (off the Southeast coast of Africa…). It has had a raucous history, in turn under Arab, Portuguese, Dutch, French, and British rule. It became independent in 1968, and a UK Commonwealth state in 1992. It’s history is reflected in the book, which is in English, yet all the blurbs on the back—as well as two introductory essays—are in French, without translation. 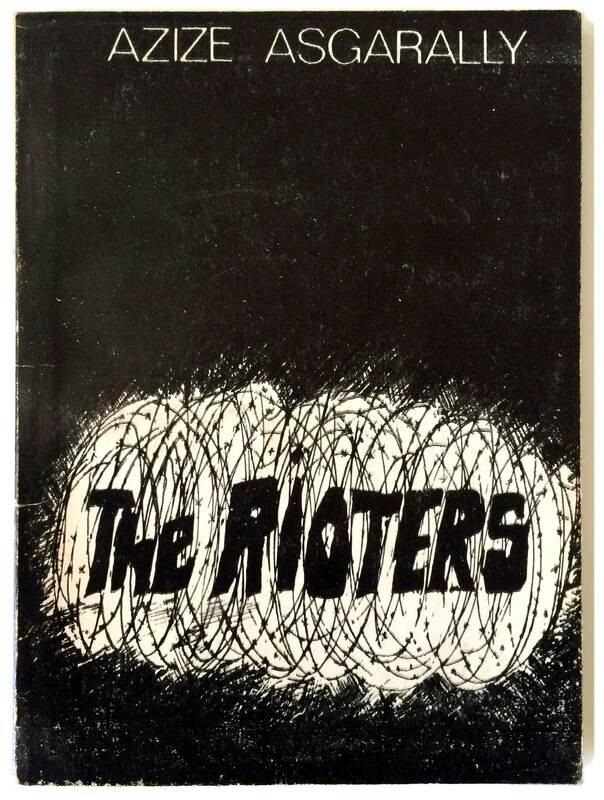 It was published by l’Oyster Publishing, and while there is no date, I suspect around 1980. The paper and binding are cheap, the text printed likely with linotype, so each page’s texture is made unique by the heavy indents of the struck type. And the cover is just great. Solid darkness is broken into by a riot of barbed wire and hurricane fencing, the hand-written title emerging out of the loops in sturdy hand-drawn type. Everything about it conveys the meaning of the title—danger and threat, but also excitement and power. 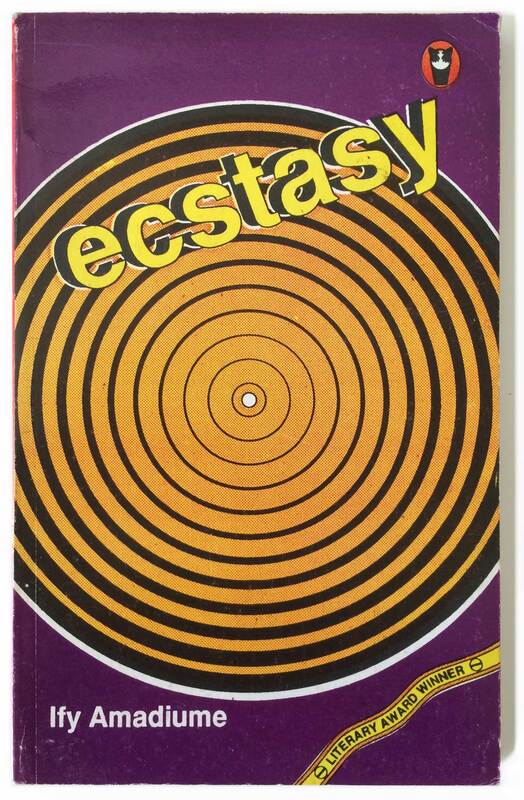 Next up is Ify Amadiume’s poetry collection Ecstasy. It’s published on Longman, which is technically a British company, but it’s a 1990s Longman Nigeria book, published out of the Ikeja office, and printed in Lagos—an entirely Nigerian publication. 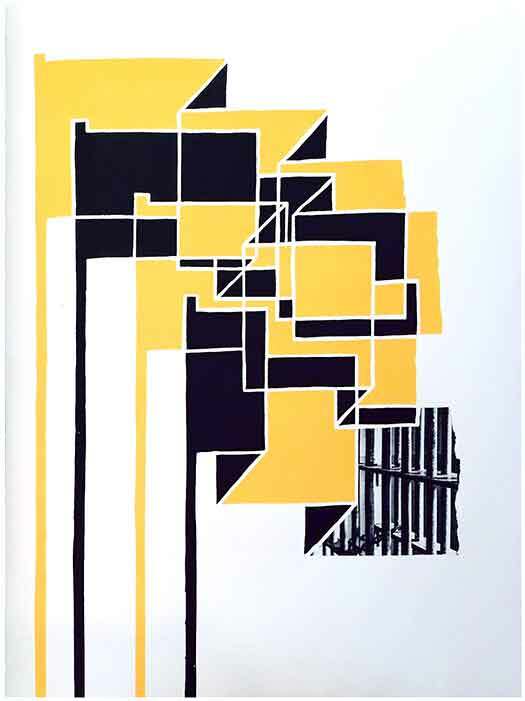 While the book retains the publisher and series logos of Longman and their “Drumbeat” imprint, the cover is poorly printed in an awkwardly offset combination of four spot colors: black, purple, red, and yellow. The title is set in a bold outline of Helvetica, drop-shadowed and floating over a giant hypnotic set of concentric circles. Calling to mind a booming speaker, or a bad trip, the cover is definitely striking, yet far out of the realm of what you would typically see on a popular title here at home. To the right are two titles from The College Press’ “Spellbinders” series. The College Press is an academic publisher based in Harare, Zimbabwe, and I believe they are still publishing. This Spellbinders series seems to be intended for a teen audience, easy to read adventure stories. The covers on both books are amazing. 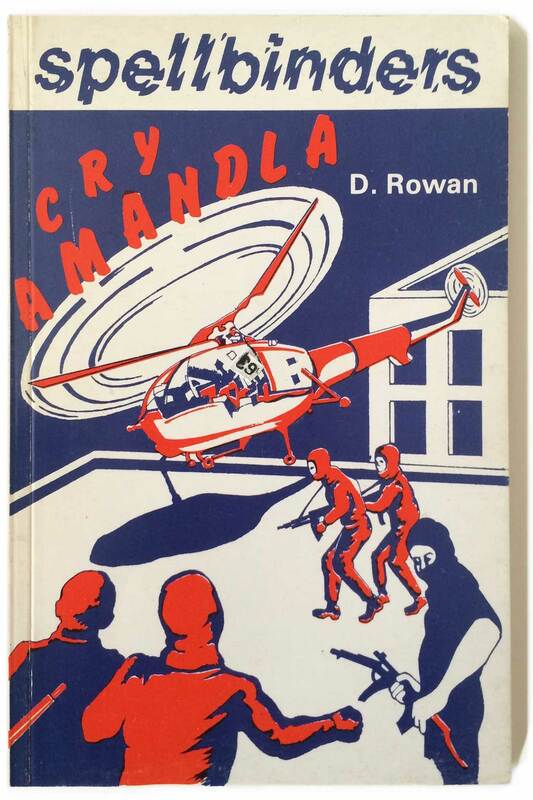 Cry Amandla is an alternative future of South Africa drawn straight from the headlines of the late 1980s, the plot summary on the back reads: “. . . the gripping story of how an alliance of black mine workers and a motley band of men and women of action join forces to capture the President of apartheid South Africa in order to gain the freedom of the true political leader of South Africa.” Like a non-reactionary Michael Creighton thriller! The cover features a crew of guerrillas in ski masks assaulting a helicopter, the title flying out of the spinning blades. 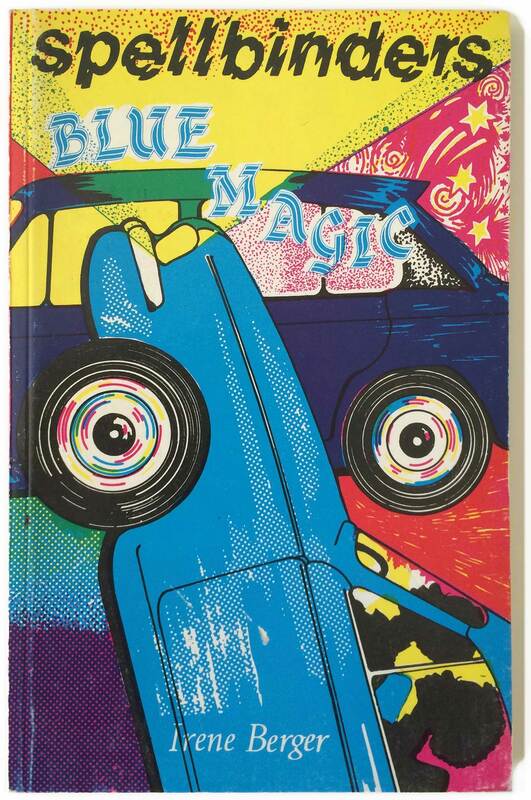 The cover of Blue Magic is just straight-up strange. The story of an old blue car that can drive itself, the cover is a train wreck of imagery, with two cars converging on a single wheel, headlights illuminating pointillist textures, swirls, and stars, ziptone patterns converging with hand-scrawled marks, and a crash of fonts. Once your vision starts to make sense of that mess, the two wheels that are central to the design resolve into big, bugged-out eyes, making the entire cover some sort of cubist automotive face. The entire thing is so outrageous it feels like a cover for a J.G. Ballard novel that was far too outrageous to be used by any U.S. or UK publisher. 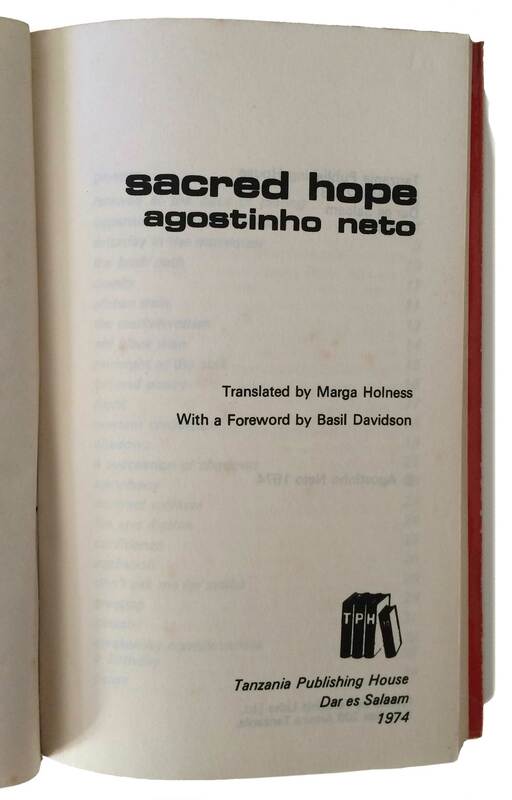 The final book this week is a really nice pocket edition of Augustinho Neto’s poetry entitled Sacred Hope. Neto was an Angolan poet, but also a communist and the leader of the MPLA (Popular Movement for the Liberation of Angola), which fought and won Angola’s independence from Portugal in 1975. 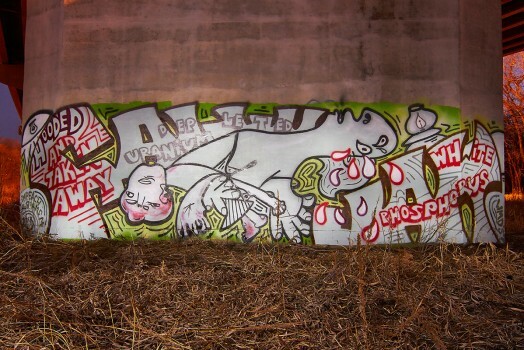 It wasn’t an easy struggle, and Neto spent seven years as a political prisoner. He also served as Angola’s first president, from 1975–1979. 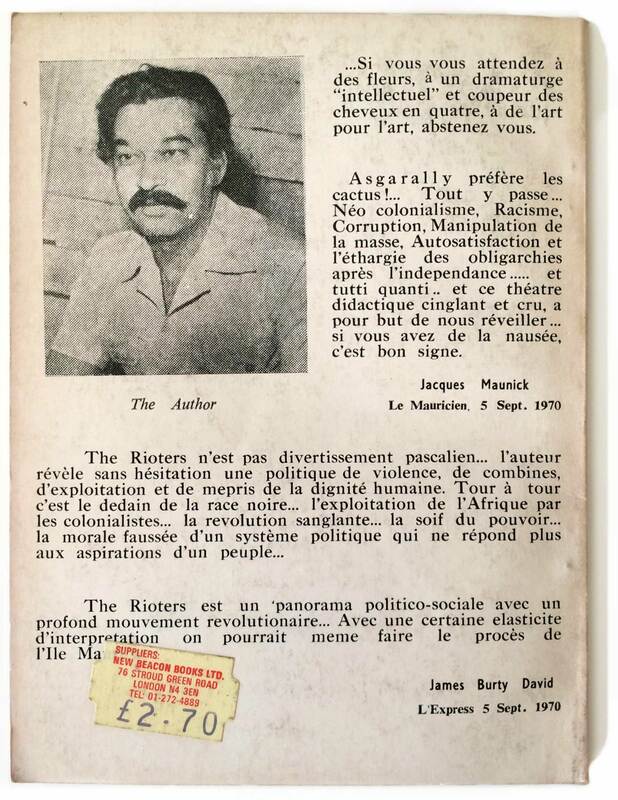 The book was published on the cusp of Angolan independence in 1974 by Tanzania Publishing House in Dar es Saalam, and features a nice overview and introduction by British leftist and Africanist Basil Davidson. 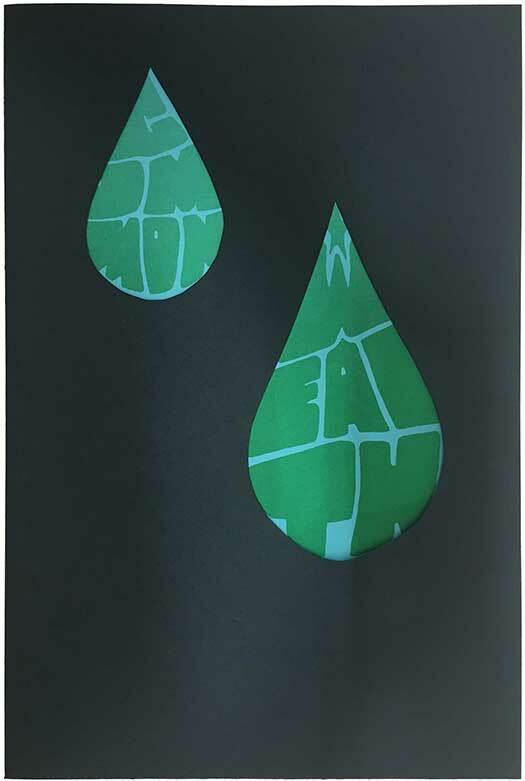 The cover is strikingly bold and simple. 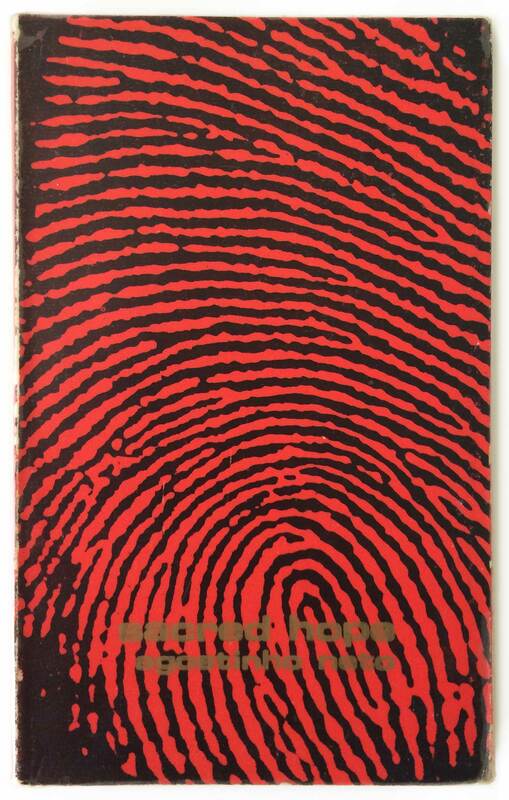 A giant red and black fingerprint fills the entire frame, the whorls also reading as a maze, prison, or topography. The title and author are stamped in gold on top. Originally they might have popped out, but on my copy they have faded and become hard to read, which for me doesn’t detract, but actually adds to the cover, making the giant fingerprint that much more imposing. The color schema is intentional as well, with red, black, and gold being the colors of both the MPLA and the future Angolan flag. One of the less obvious characteristics of this cover I like is actually not so much what it is, but what it isn’t. So much of the political imagery coming out of the struggles of Lusophone Africa is a jumble of hammers, hoes, stars, guns, and fists—the usual populist/communist icon combining. 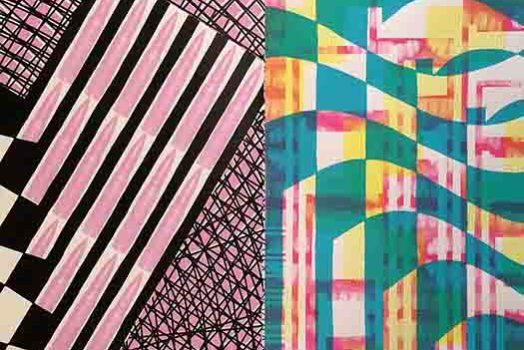 it’ really refreshing to have a revolutionary title that forgoes all of that for something as simple as a fingerprint, allowing the color scheme to do the didactic work and leaving the image open and thought provoking. 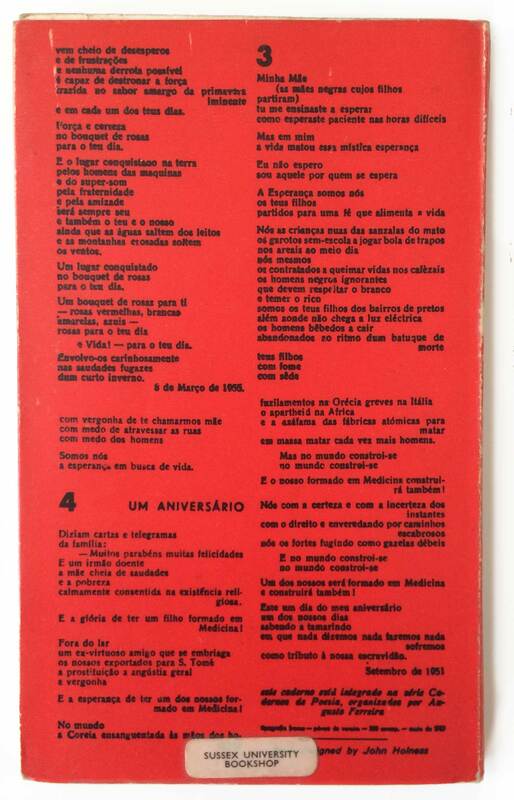 The cover features glued-down French flaps, with the back cover and inside back cover reproducing a clandestine publication of four of Neto’s poems written in prison. 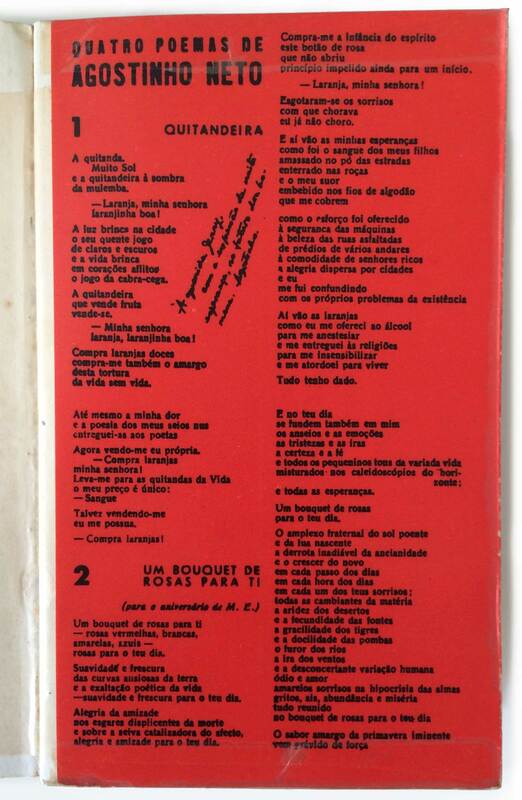 The book states that 500 copies of the original edition were printed by anti-colonial forces in Portugal in 1957. For next week I’ve got another half dozen books from Kenya, Nigeria, and South Africa. 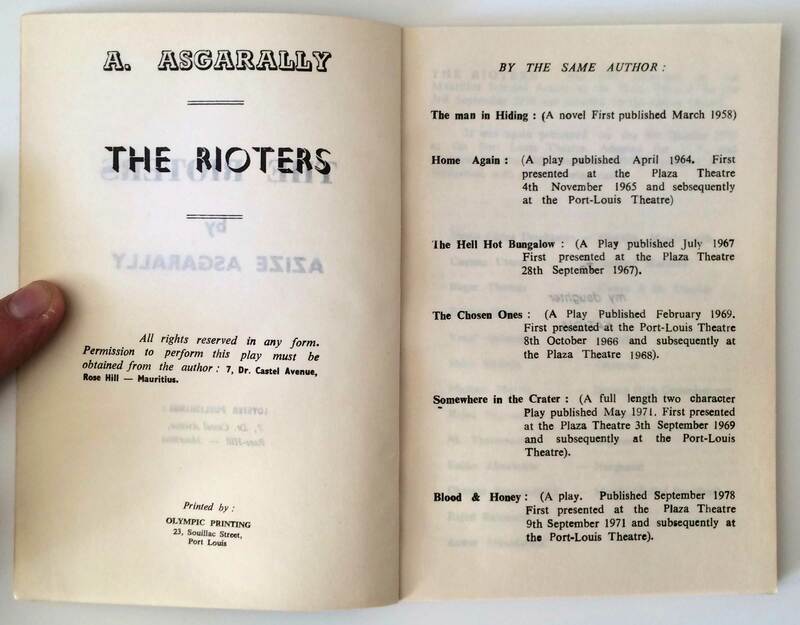 Alize Asgarally, The Rioters (Port Louis, Mauritius: l’Oyster Press, n.d.). Cover design unattributed. Ify Amadiume, Ecstasy (Ikea: Longman Nigeria, 1995). Cover design unattributed. D. Rowan, Cry Amandla (Harare: The College Press, 1988). Cover design unattributed. Irene Berger, Blue Magic (Harare: The College Press, 1989). Cover design unattributed. 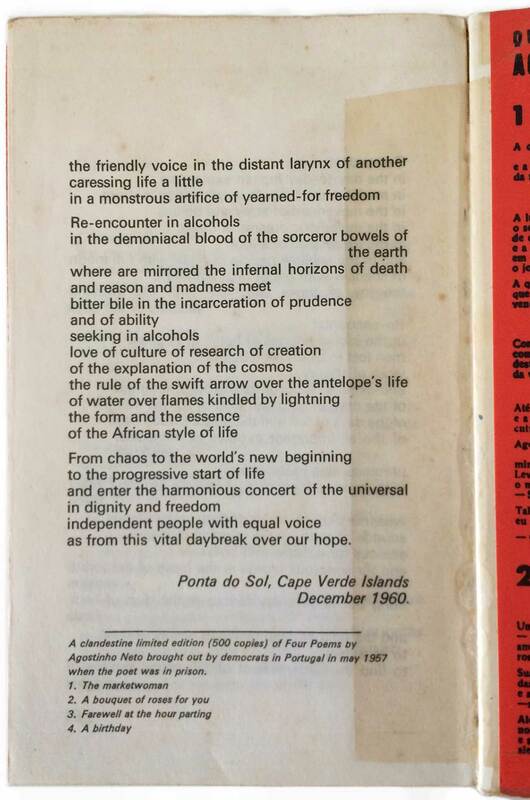 Agostinho Neto, Sacred Hope (Dar es Salaam: Tanzania Publishing House, 1974). 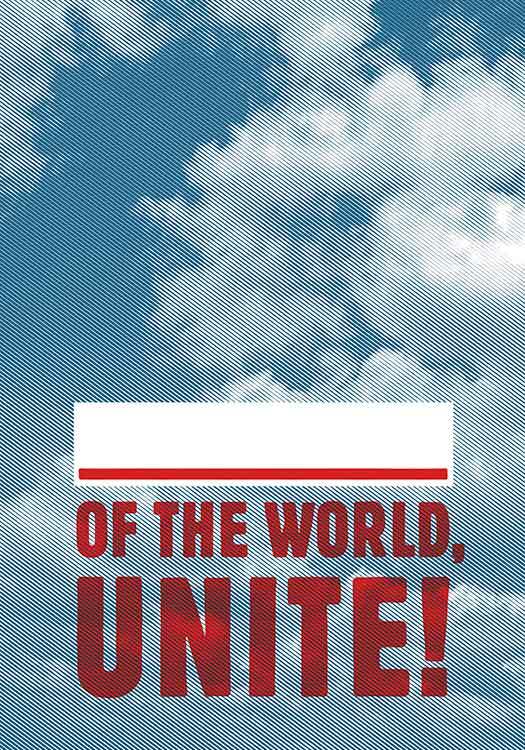 Design by John Holness.